The aim of this work is to investigate changes in the anterior joint space (AJS) and the relationship of such changes to clinical symptoms in chronic temporomandibular joint disorder (TMD) patients, and to compare symptoms between chronic and acute TMD patients. Data from 100 TMD patients diagnosed based on the Diagnostic Criteria for Temporomandibular Disorders (55 women; mean age 34.34 ± 14.88 years) including 50 patients with acute TMD (aTMD) and 50 patients with chronic TMD (cTMD) were analyzed. The AJS was calculated based on cone-beam computed tomography images analyzed using AutoCAD software (Autodesk Inc., San Francisco, CA, USA). The presence of osteoarthritis (OA) in the temporomandibular joint (TMJ) was evaluated using bone scintigraphy. Bilateral OA was significantly more frequent in patients with cTMD than in those with aTMD (50% vs. 30%; p < 0.05). Significant differences in the AJS of the TMJs were found between patients with cTMD and those with aTMD. AJS values of both right and left TMJs were significantly smaller in the patients with cTMD than in those with aTMD (4.18 ± 1.71 mm2 vs. 7.35 ± 1.71 mm2, and 6.20 ± 2.88 mm2 vs. 7.34 ± 2.47 mm2, respectively; p < 0.05). In patients with cTMD, narrowed AJS was correlated with increased dysfunction index (r = −0.373, p < 0.01). Over time, AJS of the TMJ can be narrowed in TMD patients, causing aggravation of TMJ dysfunction. Consent for publication: The authors take full responsibility for the content and writing of the paper. 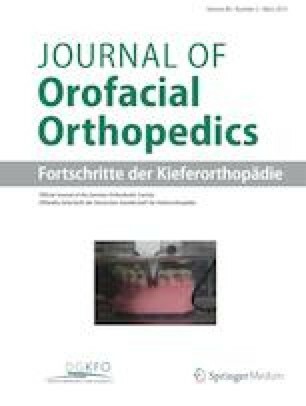 Ziel der vorliegenden Studie war es, Veränderungen des Gelenkraumes („anterior joint space“) die Wechselwirkungen dieser Veränderungen mit klinischen Symptomen bei Patienten mit chronischer mandibulärer Dysfunktion zu untersuchen und die Symptome zwischen chronischen und akuten CMD-Patienten zu vergleichen. Daten von insgesamt 100 CMD-Patienten (55 weibliche Probandinnen; Durchschnittsalter 34,3 ± 14,9 Jahren), darunter 50 Patienten mit akuten (aTMD) und 50 Patienten mit chronischen CMD-Beschwerden (cTMD) wurden unter DC/TMD Kriterien analysiert. AJS wurde anhand von DVT-Aufnahmen mit AutoCAD Software (Autodesk Inc., San Francisco, CA, USA) berechnet. Das Vorliegen von Osteoarthritis (OA) des Kiefergelenkes wurde knochenscintigraphisch untersucht. Beidseitige Osteoarthritis trat bei Patienten mit cTMD häufiger als bei Patienten mit aTMD auf (50 % vs. 30 %; p < 0,05). Signifikante Unterschiede hinsichtlich des Gelenkraumes des Kiefergelenkes wurden bei Patienten mit cTMD und aTMD festgestellt. AJS Werte des rechten und linken Kiefergelenkes waren signifikant niedriger bei Patienten mit cTMD als bei Patienten mit aTMD (4,18 ± 1,71 mm2 vs. 7,35 ± 1,71 mm2, und 6,20 ± 2,88 mm2 vs. 7,34 ± 2,47 mm2; p < 0,05). Bei Patienten mit cTMD korrelierte der eingeengte AJS mit einem erhöhten Dysfunktionsindex (r = −0,373, p < 0,01). Bei CMD-Patienten kann eine Einengung des vorderen Gelenkraumes vorliegen, was zu einer Verschlechterung der craniomandibulären Dysfunktion führt. Y.-H. Lee, I.K. Hong and J.-S. An declare that they have no competing interests. All procedures performed in studies involving human participants were in accordance with the ethical standards of the Kyung Hee University Dental Hospital and with the 1975 Helsinki declaration and its later amendments or comparable ethical standards. In addition, the study design in the manuscript was approved by the appropriate ethics review boards of Kyung Hee University Dental Hospital. Informed consent was obtained from all individual participants included in the study.